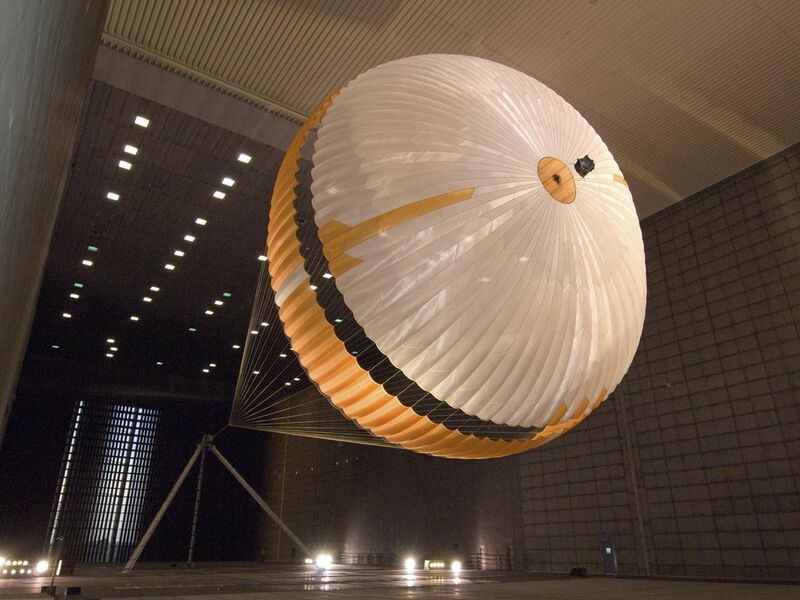 The parachute for NASA's next mission to Mars passed flight-qualification testing in March and April 2009 inside the world's largest wind tunnel, at NASA Ames Research Center, Moffett Field, Calif.
NASA's Mars Science Laboratory mission, to be launched in 2011 and land on Mars in 2012, will use the largest parachute ever built to fly on an extraterrestrial mission. 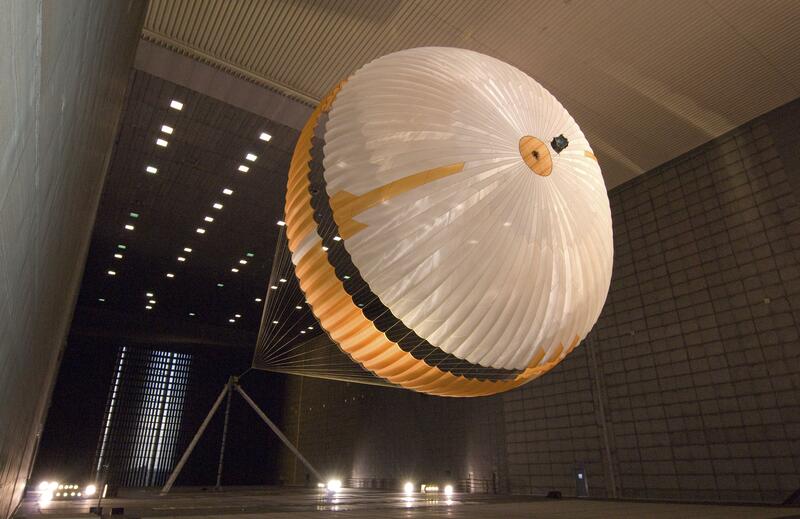 This image shows a duplicate qualification-test parachute inflated in an 80-mile-per-hour (36-meter-per-second) wind inside the test facility. The parachute uses a configuration called disk-gap-band. It has 80 suspension lines, measures more than 50 meters (165 feet) in length, and opens to a diameter of nearly 16 meters (51 feet). Most of the orange and white fabric is nylon, though a small disk of heavier polyester is used near the vent in the apex of the canopy due to higher stresses there. It is designed to survive deployment at Mach 2.2 in the Martian atmosphere, where it will generate up to 65,000 pounds of drag force. The wind tunnel is 24 meters (80 feet) tall and 37 meters (120 feet) wide, big enough to house a Boeing 737. It is part of the National Full-Scale Aerodynamics Complex, operated by the Arnold Engineering Development Center of the U.S. Air Force. 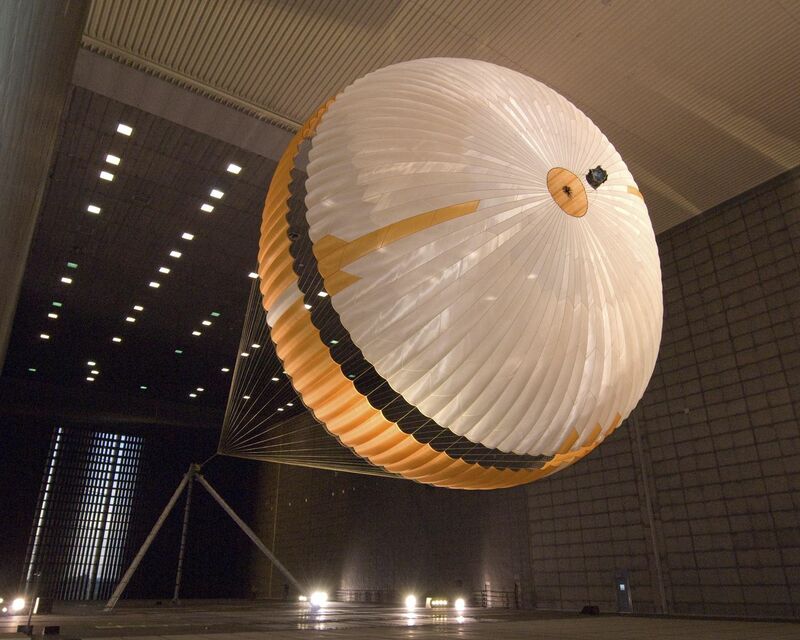 Pioneer Aerospace, South Windsor, Conn., built the parachutes for testing and for flying on the Mars Science Laboratory. NASA's Jet Propulsion Laboratory, Pasadena, Calif., manages the Mars Science Laboratory project for the NASA Science Mission Directorate, Washington, and is building and testing the mission's spacecraft. JPL is a division of the California Institute of Technology.